I was recently out in San Jose for a business trip, John Ruberto, friend of mine and one of the engineering leaders for QuickBooks Pro Product, offered to give me an insider’s look at the company and how they apply lean startup concepts. Yes, Intuit, the company that brought you TurboTax, QuickBooks Pro, and Mint.com – the company you might use to balance your checkbook or pay your taxes. One of the earliest adopters of the “lean startup” philosophy, Intuit earned its own mention in the original Lean Startup book. Here’s how the process works: Instead of arguing about what design is best, having meetings, briefings, and PowerPoint, the designers just go ahead and mock up the designs, using a tool like balsamiq. Five designs, six designs, or more. They could have entirely different workflows, it doesn’t matter; as long as the design allows the user to accomplish what the feature is supposed to do (the “goal”), then the design is good enough … for now. 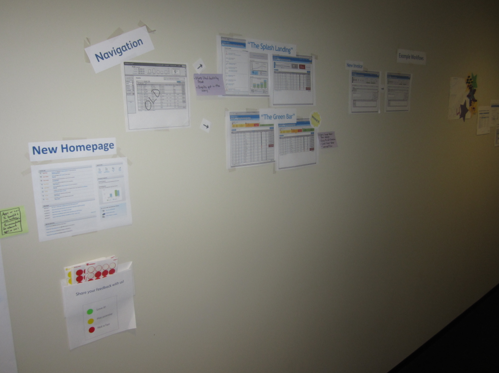 Once the mockups are done (really, it’s drag and drop, the process can take minutes for a screen, not days), the teams print off the choices and tape them to a wall, like you see above. Anyone dropping by can vote with green (“I like it”), yellow (“has potential”) or red (“I don’t like it”) stickers. After a few days, the teams count the number of red, yellow, and green stickers and select two winners. Yes two. The next phase is build and beta, where the change is rolled out to two different beta groups. Half get interface A, the other half interface B. After another period of time, perhaps a month, the team selects a clear winner, likely based on click-through statistics and return rate. This final version gets another round of fixes, compatibility testing on more devices, more documentation and support, and a final push to production. That makes the final product validated for acceptance, not just thrown out with a wish and a hope. After fifteen-odd years contributing on commercial software projects, I dare to say, there is far too much hoping going on. Wait … is Intuit even a startup? “Lean Startups” conduct experiments to figure out what the customer will buy. The experiments tweak the product and help design it before the company has built the product. The “startup” part implies the search for a sustainable business model. But doesn’t that mean that a real company, like Intuit, could reasonably claim to not need validated learnings when they have revenue? Perhaps, but think about Intuit again. When it started, the company sold software to balance your checkbook for MS-DOS. In boxes. At retail stores. How many MS-DOS applications do they sell at retail stores now? For that matter, how many software retail stores are left, and how much longer do they have? The amazing thing about intuit is that it has already survived three major market shifts, from DOS to Windows, Windows to the Web, and now the conversion to Social/Mobile products. Companies that are profitable, ones that have revenue, can conduct experiments just like this one, and be paid back in real dollars, right along with the learnings, which can create new products, new customers, and new markets. In order to do that, though, our thinking about the metrics themselves may need to change a little. Next time, we’ll talk about lean analytics.